There’s a lot of things about wedding planning that you have no idea about – until you get engaged. Actually, I have to laugh because as soon as you’re engaged the first thing people ask is “have you set a date! ?” I’m sure I’ve been guilty of this before when my friends or family have gotten engaged. We called family and friends within an hour of Adam popping the question and more than once we were asked “So, have you got a date?” We were both like “no, it just happened half an hour ago!” should we have this figured out that soon?? Even a month later, we’re no closer to figuring out a set date or venue location. One thing we have decided is that it won’t be this year – with our date in mind it would have been much too quick to get everything done this year (although I’m sure it could be done, I’d rather enjoy our engagement than stress over rushing through preparations.) We have a few appointments to look at venues for a 2015 wedding, which will give us lots of time to prepare, plan, and most importantly, enjoy our engagement. A couple weekends ago I attended my first ever Wedding Fair. I thought it would be totally overwhelming, but it was actually really enjoyable. I now have hundreds of brochures and bridal magazines to peruse. Just before meeting with a friend to chat about our engagement over coffee one afternoon, I popped into London Drugs and found this puffed quinoa cereal. 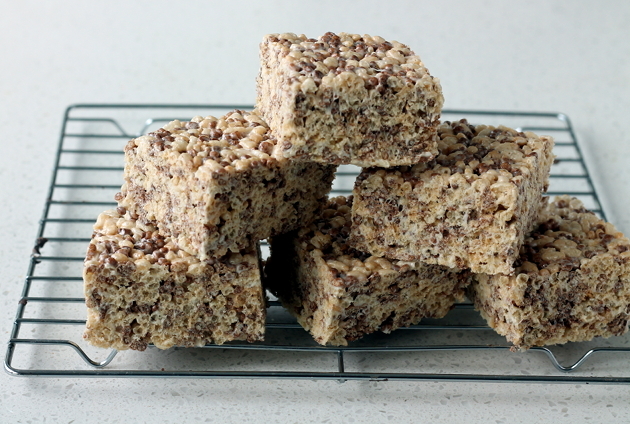 I hadn’t seen quinoa cereal before and instead of thinking about it as a breakfast food, I immediately thought about turning them into squares. Rice Crispy Squares are one of Adam’s favourite things, and I guess he is my fiancé now, so I thought I’d make him a treat since I couldn’t remember the last time I actually made them. I also bought Trader Joe’s Crisp Rice Cereal, which I found was way crispier than regular rice krispies – which makes for an even better square. I made these without butter (sub coconut oil), and you can make your own marshmallows (recipe here!) or use store bought. 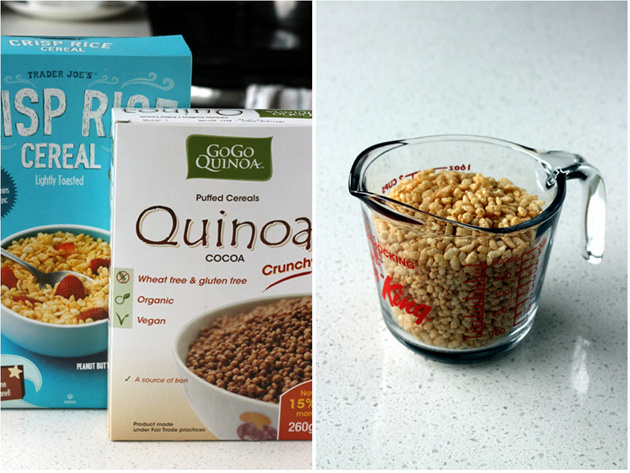 The cocoa quinoa reminded me of my favourite tri-colour qunioa, yum! 1. In large pot melt coconut oil along with marshmallows over medium-low heat until completely melted, stirring often with wooden spoon. 2. Prepare a 9x13 baking dish, or 2 8x8 baking dishes with parchment paper, or spray with coconut oil/cooking spray. 3. When marshmallows are completely melted, turn off heat. 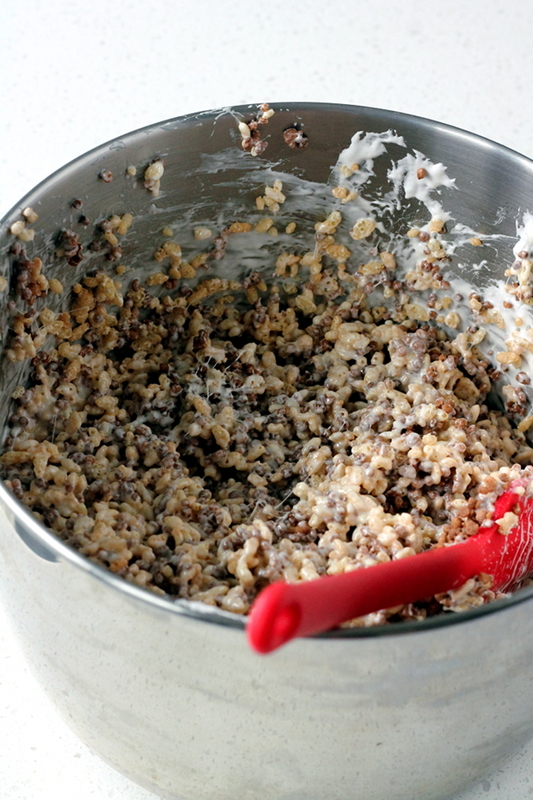 Pour in the Quinoa and Rice cereal and stir together until well incorporated. 4. Pour mixture into prepared pan and, using a large metal spoon sprayed with cooking spray, push down and smooth out using the backside of the spoon. 5. Set aside and cool completely. Cut with knife into squares, store in ziplock bag or container on the counter for up to a week. Never stop amazing me ! One comment Where’s My Sample!! Marshmallows aren’t vegan as they’re made with gelatine. Or are you using vegan marshmallows? That is true! You can buy Vegan marshmallows – there are a few website’s I’ve seen that have lots of substitutes for Gelatine including agar, or irish moss. You can also buy Vegetarian Gelatine!